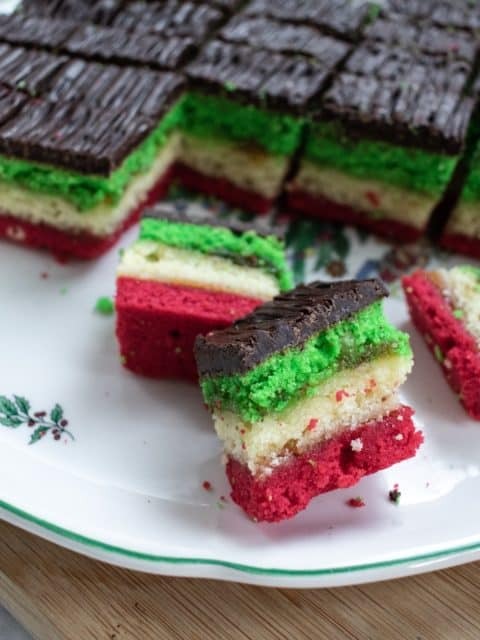 Italian Rainbow Cookies are traditionally made for Christmas, but are still extremely popular throughout the year. They represent the Italian flag and have rich flavors of almond, chocolate, and apricot. 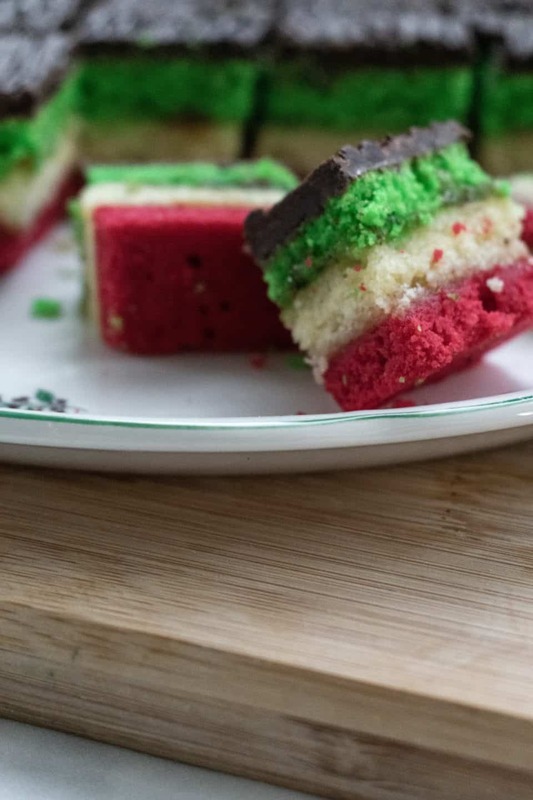 Rainbow cookies are the Christmas cookie you never knew you needed in your life, but once you’ve had it – there’s no going back. 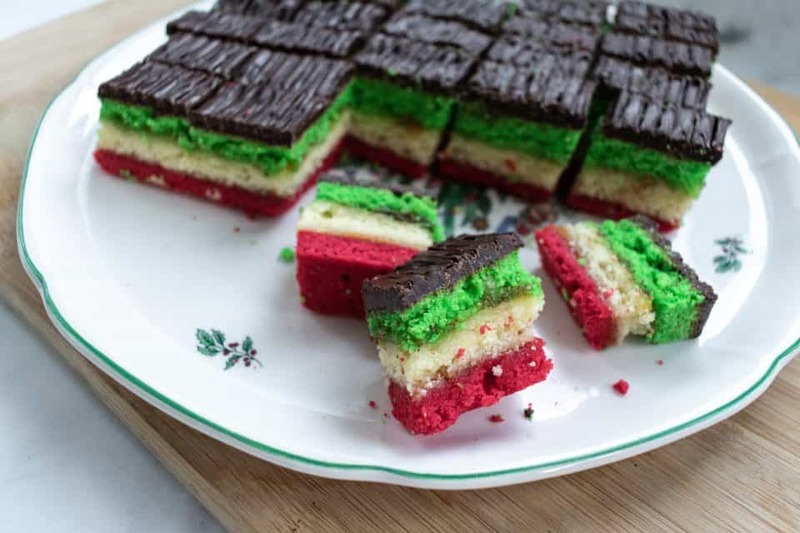 I don’t actually know where they got their name, especially because the three colored layers of cake represents the Italian flag. There’s three main flavors in rainbow cookies: almond, chocolate, and apricot jam. The cake doesn’t use baking soda or baking powder to rise, but stiff whipped egg whites. All those little bubbles make three separate thin cakes, similar to a soufflé. Between each layer of cake is a thin layer of apricot jam while the whole thing gets coated in smooth chocolate. 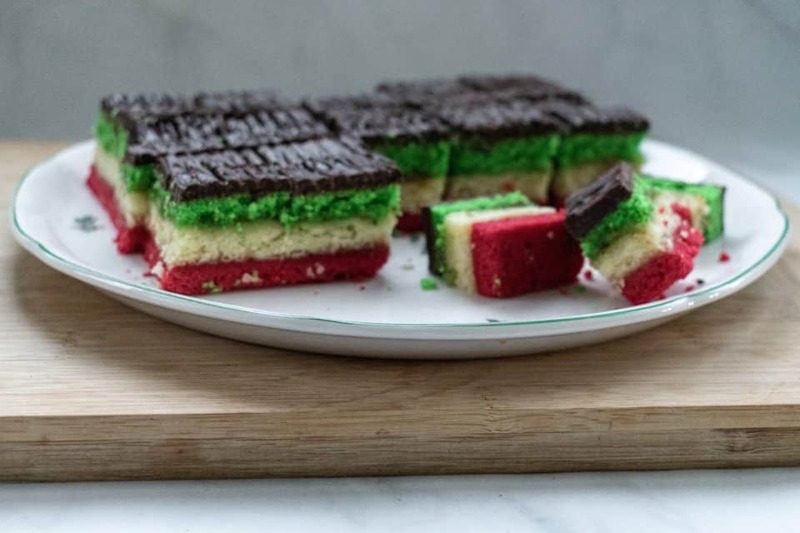 I think that Rainbow cookies are fairly easy to make, but people shy away from them because they are made as a huge sheet cake and have several steps. Once you cope with the idea of making 100+ cookies on one sheet pan, I’ll assure you that the hands on time for this is well worth it. They are also extremely fun to make with others! Patience. Egg whites need to have “stiff peaks” which is a fancy term for – being stiff enough to hold its shape when you pick up the mixer. It’s important to have patience while whipping these because this is what’s going to make your cake spongy. Give it 8 minutes. Smoothing the batter. Almond paste can have a tendency to remain in clumps. Unlike pancakes, those clumps don’t magically cook out, they’ll be in your cookies just as is. So when you’re breaking up the almond paste try to get it as smooth as you can. Parchment paper. This is part of the magic trick of layering the cakes on top of each other, don’t skip it! It makes it super easy to lift your cake out of the pan & also assures that it won’t get stuck to the baking sheet and rip. Cool to the touch. Not letting cakes cool completely before stacking them increases the chance of them falling apart when you’re trying to invert them out of the pans and onto each other. 4 hours minimum. This step is important because it compresses all those layers to form together and not slide off of each other when you cut the cookies. I always let mine from overnight to avoid this. Cut when tacky. I made the mistake the first time I ever made them of waiting until the chocolate was fully cooked and hardened to cut the cookies – big mess! The chocolate will be tacky after about 10 minutes and ready for you to cut. Tip: waited too long to cut? Put the whole cake back in the oven for a few minutes to strategically melt the chocolate to be able to cut it! Whew, okay – hopefully I didn’t scare you off from making these now! But since you now know the most challenging parts of the recipe, you’ll be well equipped to tackle these cookies once and for all. The reaction on people’s faces when they eat them (even if they look messy and aren’t neat like from the bakery) is well worth it. 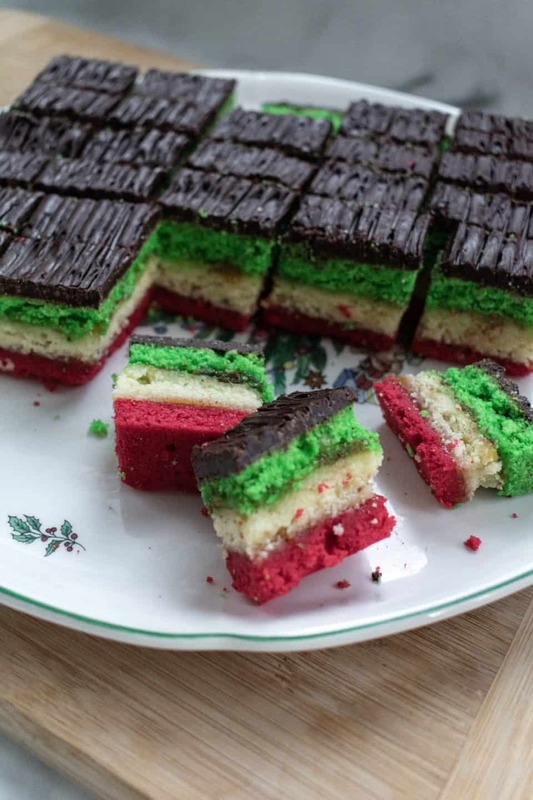 Note that this recipe is a large batch because since starting this tradition, I need to feed so many people with rainbow cookies that a small recipe is not an option! You won’t ever have too many leftover rainbow cookies, but if you’d rather start off with a smaller batch, cut the recipe in half. In a large & deep bowl, break apart the almond paste and 1 ¾ cup sugar by beating with a handheld electric mixer on medium-high speed until the crumbles start to break up a bit. Beat in all of the butter into the almond paste, half a stick at a time & mix until well combined and the almond become a fine texture. Add in all of the egg yolks, one at a time, blending before adding each additional yolk. In a medium bowl, combine flour and salt. Slowly add one cup at a time to the creamed butter & sugar, blending in between. Wipe out the same bowl you used for the flour and whisk all the egg whites until foamy. Add in the remaining ¼ cup of sugar & whisk until peaks form & hold their shape. With a handheld mixer this is about 12 minutes on the highest speed. Gently fold a third of the egg white mixture into the batter at a time, turning the batter over itself instead of stirring (to not deflate the bubbles). Incorporate the batter entirely with the egg whites. The batter should be foamy. Divide the batter between three bowls. Add several drops of green food coloring to one of the bowls, adjusting to your preference. Gently fold in. In another bowl, add in the red food coloring. Leave the last bowl uncolored. Spread each bowl of batter onto its baking sheet. (One pan for each color). Spread the batter out by wetting an offset spatula (or spoon) and pushing the batter out to the edges of the pan, making the whole sheet as even as possible. Bake the cakes each for 8-10 minutes. They should be fully cooked & just beginning to brown around the edges. Let cool completely in the pans. Cover the cake with plastic wrap & place one of the baking sheets on top of the cake. Put this in the refrigerator & evenly weigh down with heavy cans or containers. Let cake compress for at least 4 hours, or overnight. Remove cans, baking sheet, & plastic wrap. Place the cutting board on top of the cake and flip to invert it onto the cutting board. Remove parchment paper. Trim the cake wit a sharp knife, so it is even on all sides. Melt the chocolate in a microwave safe bowl, stirring every 30 seconds. Using an offset spatula or spoon, spread the chocolate evenly all over the cake. Let set slightly. While the chocolate is still tacky, slice the cake into rectangular pieces with a sharp knife. (For a clean cut, wipe knife clean of chocolate in between each cut). Slice about 10 strips horizontally & 13 columns vertically, making 130 pieces (roughly 11 dozen). Now, go find some friends to share these masterpieces with! Equipment needed: 3 (15×9) baking sheets, large cutting board, parchment paper Note: The cake needs to be compressed for at least 4 hours before cutting it into individual cookies. This recipe is much easier with a stand mixer than a handheld electric mixer. Store in an airtight container for 10 days.